by wangdu on March 6, 2013 in Events. The Directors of Crane Kalman Gallery invite you to the Exhibition ‘BEHIND THE PICTURE’. Paintings and Narrative by Simone Sandelson. Proceeds from sale of giclée prints will be donated to The Rigul Trust and The Juvenile Diabetes Research Foundation. 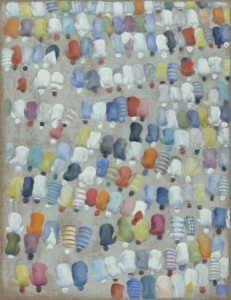 (Image: ‘Prostrations’ by Simone Sandelson).